If you don’t know…please get to know!!! I have been WAXING LYRICAL about Lush since late 2004. I LOVE IT! Lush is an English natural cosmetics company who have stores all over the world. What seperates them from most natural cosmetics are their fun,girly looking products (they actually look good enough to EAT) and the fact that unlike their other cosmetics counterparts, their products are ACTUALLY 100% natural. Having worked at Lush a couple years ago, i can deffo vouch for that. It’s so fun working over there too! It hardly feels like work as you’re having so much fun, singing and dancing and just generally being camp lol! And when you’re in employment there, you get £200 worth of free products, which i got. GOOD,GREAT,AMAZING TIMES!!!! The shop actually resembles a candy shop! All the products are so bright and colourful and pretty! Flying Fox Shower Gel: Simply put, smells amazing and leaves your skin feeling hydrated, soft and smooth…And you smell nice the whole day! 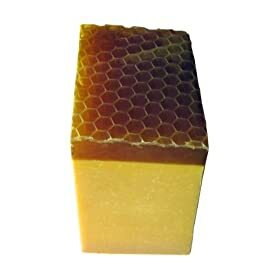 Honey I Washed The Kids Soap: Yes, that is genuine 100% Honeycomb attached to the soap, used for exfoliation purposes. I should warn you though, you should ONLY use this soap if you’re planning on taking a looong shower or bubblebath…because the SMELL. My gosh the smell is just…incredible! If you’re taking a quick shower, don’t use this because you won’t leave the bathroom. It smells so delicious you’d just want to keep on using it! The honey is uber moisturising and the fragrance will stay with you all day. Arrrrgh I love Lush so much! Sooooo much better than the Body Shop in my opinion. I need to go back and buy some more stuff from there when my funds regenerate. But as for now, I have to stick with stupid old Superdrug products =(.